The plaque beneath the awning of the Café au Réveil Matin in Montgeron in the southeast suburbs of Paris marks the spot from where the first 60 riders to compete in the world’s greatest race set off on the inaugural Tour de France on 1 July, 1903. Ahead of them lay 2,428 kilometres of racing split into 6 monumental stages with the last, and longest, covering 471 kilometres from Nantes to Paris. 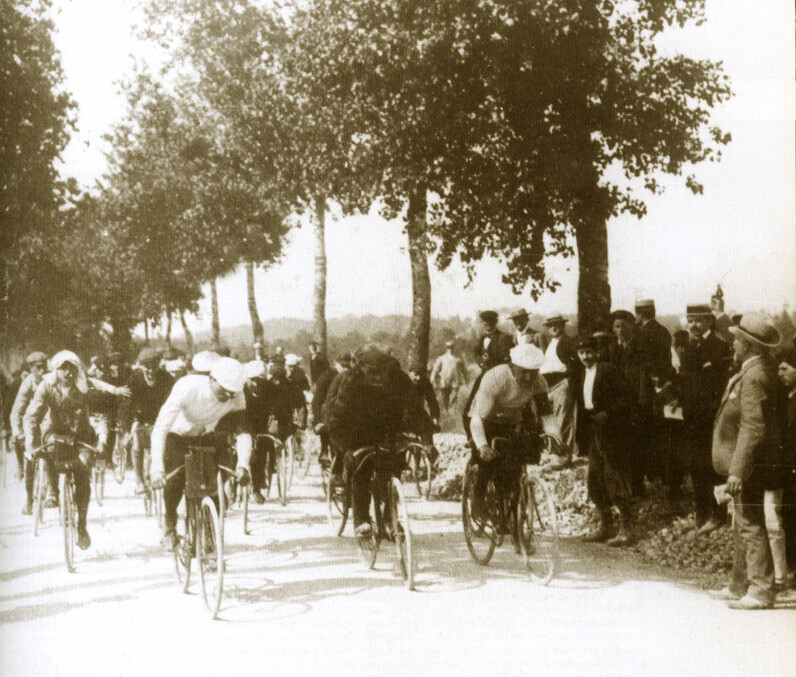 Le Tour was a grand experiment in racing, the like of which had never been seen before. Yet it was not the first boucle of France. That honour had fallen to Théophile Joyeyx who in May 1895 cycled 4,429 kilometres around France in 19 days at an average of 235 kilometres a day. En route Joyeux had considered quitting but was persuaded to continue by his supporters, one of whom was the holder of the first officially sanctioned Hour record, Henri Desgrange. Eight years later Desgrange was the editor of the sports newspaper, L’Auto. The paper had been founded in 1900 amid the furore of the Dreyfus affair when the artillery officer, Captain Alfred Dreyfus, had been arrested and convicted for treason in 1894, alleged to have communicated French military secrets to Germany. While Dreyfus languished in the notorious penal colony of Devil’s Island, the real culprit, Major Ferdinand Walsin Esterhazy, was named as the guilty party during an investigation instigated by the new head of counter-espionage, Lt-Colonel Marie Georges Picquart. High ranking military officials suppressed the new evidence, acquitting Esterhazy and accusing Dreyfus of additional crimes supported by falsified documents. The sniff of scandal and cover-up quickly spread, leading to Émile Zola’s famous open letter, J’accuse. Zola’s impassioned defence of Dreyfus and his list of accusations against senior military officers, including the Minister for War, General Jean-Baptiste Billot, added more fuel to the fire. French society was split between Dreyfusards who clamoured for justice while anti-Dreyfusards insisted that justice had been done. Both Picquart and Zola were also to find themselves victims of the establishment, with Zola sued for defamation of a public authority and Picquart court-martialled for allegedly forging the letter that confirmed Esterhazy’s guilt. It was against this background that L’Auto was founded by Comte Jules-Albert de Dion. Convinced of Dreyfus’ guilt, Dion was arrested and jailed for 15 days after striking the President of France, Émile Loubert, with his cane during an anti-Dreyfusard protest at the Auteil horse racing course in 1899. The sports newspaper Le Vélo’s report on the incident angered Dion, who objected to the Dreyfusard sympathies of the paper’s Director, Pierre Giffard, prompting him, Adolphe Clément and Édouard Michelin to withdraw their advertising. In 1900 they set up their own rival newspaper, L’Auto-Velo, with the express intention of ruining Giffard and Le Velo. Desgrange was appointed as editor. The first edition of the paper was published on 16 October, 1900, printed on yellow paper to distinguish it on the newsstands from the green of Le Velo. In 1902 Giffard successfully sued L’Auto-Velo for infringement of title, prompting a change in name to L’Auto from 1903. Initially successful, L’Auto’s circulation was in decline by 1903 prompting a crisis meeting at the paper’s headquarters in Rue du Faubourg-Montmartre. It was there that one of the paper’s journalists, Géorge Lèfevre, mooted the idea of a race around France inspired by the six-day racing of the track world. Desgrange was initially non-committal but over lunch at the Taverne Zimmer in Boulevard de Montmartre he warmed to the idea, agreeing to speak to Victor Goddet, the man who held the purse strings. Goddet was enthusiastic, allegedly opening the safe and inviting Desgrange to help himself to as many francs as he needed. 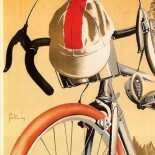 On 19 January, 1903, L’auto announced Le Tour to the French public. It was to be, “the greatest cycling trial in the entire world. A race more than a month long: Paris to Lyon to Marseille to Toulouse to Bordeaux to Nantes to Paris.” The original itinerary saw the race start on 31 May and end on 5 July, but with a week to go before the départ only 15 riders had signed up. Desgrange changed the itinerary to run between 1 and 19 July and dangled a financial carrot in the hope of drumming up more interest. The entry fee was reduced from 20 to 10 francs, per diem expenses of 5 francs were to be paid to the first 50 to cross the finish line, and a total prize pot of 20,000 francs was announced. The new offer paid dividends, with 60 riders lining up outside the Réveil Matin on 1 July for the inaugural stage of Le Tour. Ahead of them were 467 kilometres until they reached Lyon. Desgrange, still doubting, wasn’t there to see them off, the honour going to Lèfevre who followed the race by bike and train. At 3.16 p.m. in front of a large crowd the peloton set off along France’s dismal roads, most of which were little more than dirt tracks with the occasional state of the art section of cobbles. By kilometre 50 Le Tour had witnessed its first retirements, the riders unable to keep up with the early 35 kph pace. By Lyons 23 riders had abandoned, including one of the favourites, Hippolyte Acouturier. He blamed his stomach cramps and sudden loss of form on a drink taken from a bystander, “lemonade made from sulphuric acid”, as he described it, though a more likely cause was the red wine he’d imbibed en route. In a sign of things to come Stage 1 also saw Le Tour’s first instance of cheating when Jean Fischer was caught pacing behind a car in strict breach of the rule that demanded no rider receive any assistance from vehicles or another rider. As they rode into the night the pre-race favourite Maurice Garin took a slender lead, reaching Lyons on the morning of 2 July as the winner of the first ever stage of Le Tour after 17 hours, 45 minutes, and 13.2 seconds of racing at an average speed of 26 kph to don the first yellow armband as stage victor, and the first green armband as leader of the general classification. 16 days later he rode into the Velodrome Parc des Princes as the winner of Le Tour after a display of strong riding and outright skullduggery, winning 3 of the 6 stages but also bribing fellow competitors and spectators, illegally receiving food from race officials who knew that Desgrange wanted him to win, and damaging the rear wheel of his rival, Fernand Augereau. His winning margin of 2 hours, 49 minutes, and 2 seconds remains the biggest in Tour history. For Desgranges and L’Auto the race was an unmitigated success. Le Tour captured the public’s imagination and circulation of the paper soared. By 1904 Le Velo was out of business. Job done as far as Dion was concerned. Desgrange, perhaps motivated by a sense of magnanimity in victory, perhaps knowing talent when he saw it, gave Giffard a job at L’Auto. Lèfevre, the man behind the idea and the one who’d sweated round France by bike and train to ensure the race went smoothly and provide on the spot reports, was rapidly moved by Desgrange to cover rugby, boxing, and aviation. As for Dreyfus, he was finally exonerated in 1906 and reinstated as a major in the French Army, while Esterhazy escaped justice by fleeing into exile in England. Those time differences are staggering! Indeed. It’s difficult for us today with our good roads and multi-geared bikes to imagine what it was like to ride in those early Tours. I can’t imagine any situation where I’d be able to ride 471km which was the length of the 6th and final stage in 1903. I’d no idea of the link between Dreyfus and the Tour. The history of the two newspapers and the protagonists is better known. Incredible the riders cycled such huge distances on unsmooth roads on primitive bikes at such high overall speeds. Thanks Kiat. I think the idea of a Grand Tour would have been inevitable but it is a curiosity of history that it wouldn’t have happened when it did had it not been for the bitter disagreements and strong feelings that the Dreyfus case generated. This entry was posted on July 4, 2015 by aaroncripps in Cycling, France, Great Rides, History, Le Tour de France, People, Racing, Riders, Road Racing and tagged Albert Dreyfus, Cycling, Cycling History, Henri Desgrange, L'Auto, Le Tour de France, Le Velo, Maurice Garin, Paris-Lyon 1903. Mrs F. M. Cossitt: The First Woman to Ride a Bicycle in New York?